North Monterey County High School unveiled a new library and media center on Monday, August 1, providing up-to-date computers in hopes of enticing collaboration among students, who return from summer break on August 10. The center is not just meant for high school students. The revamped space will be open from 7am to 7pm every day, allowing all students in the district to have access to the facilities before and after school. In all, the new media center will serve all 4,500 North Monterey County Unified School District students in grades K-12. 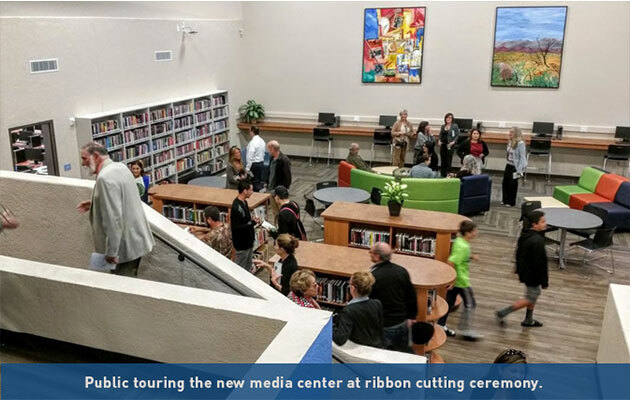 The library was funded by the 2013 Measure H facilities bond, which provided $23.8 million to North Monterey County schools; nearly $3.1 million of that was budgeted for this project. The media center will give an underprivileged student body access to computers and internet, even if they don’t have the tools at home; 20% of the NMCUSD’s student population qualifies under the federal definition as homeless, according to Superintendent Kari Yeater. “It is a basic service that our district and schools provide our students with access to technology and the internet,” Yeater says. The new center features multiple computer stations and labs, a college and career center and a family and migrant education room, as well as Chromebook laptops for students and teacher to check out. Student will also have access to the online resources that are currently available through Monterey County Free Libraries. NMCUSD teacher will integrate the new space into the curriculum, starting with training on how to use the tools including desktop computers, Chromebooks and interactive whiteboards and projectors. Gary De Amaral, a former NMCUSD board member, says the media center marks a major turning point for the district, which for years was plagued by litigation and a failure to properly spend 2003 bond money. “This multi-million dollar facility is the first visible result of a new facilities bond, granted by the voters in 2013,” De Amaral says.